Oh wow, I didn't realise before writing this post that this outfit is a third male clothing and a third kid's clothing. I'm stating the obvious here, but both kid's and men's clothing tends to be significantly cheaper than women's clothing. Actually, I usually check out women's, men's and kid's clothing equally. I definitely save myself a good wad of cash.doing this! Take this denim shirt for example - it's a Topman number I got from eBay. Topshop denim shirts were selling at the time on eBay for about £25 (yep, second hand, madness! ), but this men's version fits me fine and I snapped it up for £12. Words cannot describe the love I have for this fur collar - and we've only been together for two days. On Monday while I was in town on a visit to post my giveaway prize off to the winner I spotted this in the H&M sale (sneaky little detour on the way to the post office!). I instantly fell in love with it, it's SO soft it's unreal. It was only £4 and it's basically like having a pet (I can't lie, I keep stroking it). I really loved the subtle leopard print on it. I'm such a faux fur fanatic, in fact I've got this H&M faux fur stole coming my way for Christmas, which I'm insanely excited to wear. I might actually start calling my faux fur pieces 'pets' as I am so obsessed with them and I have the urge to pet them all the time (odd). Well, I don't have long to wait for that fur stole now! Me and my boyfriend are having our own mini Christmas on Thursday before heading to Westfield Stratford on Friday for some (unfortunately, probably just window) shopping. But maybe I'll grab a few sneaky Krispy Kremes or a cinnamon pretzel! Then I'm working all day Saturday and tootling back to the quiet little place that is Somerset on Sunday. (Please don't snow. PLEASE don't snow.) I've sorted some scheduled posts for the rest of the week that I think you'll love! I apologise if this post led you believe I genuinely had a new pet - I wish the collar was a a real (alive) cat draped around my neck, but allas, this is not possible. I really love the denim shirt/jumper combo - perfect for winter. Also the creepers are definatly starting to grow on me! 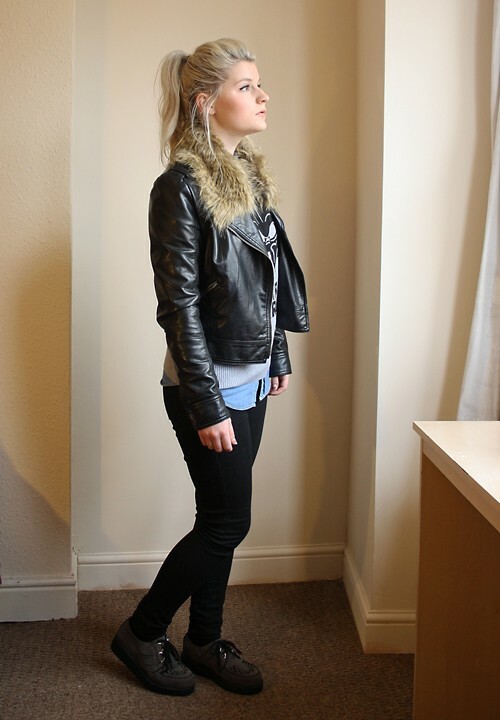 Yeah layering is essential in chilly weather! haha I got really excited when I saw the title, I'm a total pet lover but the star wars sweaters makes up for it! Love your layering! Omg I love this jumper you stunner! 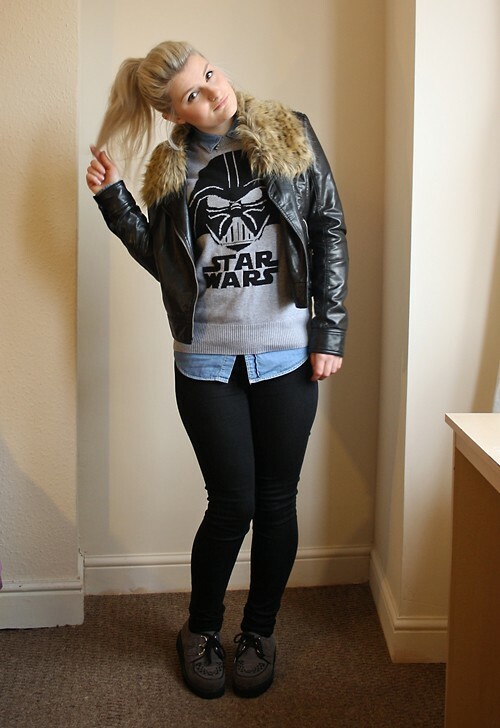 Haha, the Star Wars jumper is brilliant!! !